Astronauts aboard the International Space Station will have a unique vantage point for next week's transit of Venus, a stunning and rare event when Venus will appear as a tiny black dot on the sun as it crosses in front of our nearest star. The transit will take place June 5, and will not occur again for more than a century, in the year 2117. To add to the historical nature of the day, NASA astronaut Don Pettit, one of six members of the station's Expedition 31 crew, plans to be the first person to photograph the transit of Venus from space. "I've been planning this for a while," Pettit said in a statement. "I knew the Transit of Venus would occur during my rotation, so I brought a solar filter with me when my expedition left for the ISS in December 2011." While observers in many parts of the world — including North America, Europe, Asia and eastern Africa — will be well-placed to see at least part of the transit in person, Pettit is set to enjoy the spectacular view from his orbital perch. "The Expedition 31 crew will be the first people in history to see a Venus transit from space, and Pettit will be the first to photograph one," NASA astronaut and planetary scientist Mario Runco, Jr., of the agency's Johnson Space Center in Houston, said in a statement. Runco flew three space shuttle missions and is an expert in the optics of spacecraft windows, NASA officials said. His wife, Susan Runco, is also the coordinator for astronaut photography at the Johnson Space Center. Mario has been advising Pettit on how to capture the best possible pictures of the Venus transit from space. "For this transit, Don will be removing the non-optical quality, internal protective window panes known as 'scratch panes,' which really make crisp, sharp, and clear images impossible," Runco said. "Removing those panes is a huge plus when it comes to details that will be seen in the imagery of the sun." The spaceflyer will also equip his camera with special solar filters to view the historic transit. "I'll be using a high-end Nikon D2Xs camera and an 800mm lens with a full-aperture white light solar filter," Pettit said. On June 5, Pettit plans to shoot photos through the side windows of the space station's lookout dome. This seven-window observation room, called the Cupola, was built by the European Space Agency to provide wide-angle views of Earth and the cosmos. "Even with this great camera system, the images would be quite soft if the scratch panes were not removed," Runco said. "This is only the third time that we'll be [shooting through] the Cupola's optical quality windows. I'm hoping this becomes routine in the future." Astronauts aboard the space station typically hole up in the Cupola to operate the outpost's robotic arm, oversee and coordinate space dockings, and take photos of the Earth and sky for scientific research and public outreach. Station crewmembers often describe the Cupola as a popular spot to catch breathtaking views during off-duty time. According to NASA, astronauts were onboard the space station on June 8, 2004, when the last transit of Venus occurred, but they were not able to witness the event, primarily because there were no solar filters on the orbiting outpost. As Venus passes in front of the sun, the planet will cover only a small fraction of the solar disk, which means observers need to take proper precautions. It is very dangerous for humans to stare at the sun (even mid-transit) without proper eclipse glasses or solar filters for binoculars and telescopes. Pettit is expected to rapidly post his photos online, as the roughly 7-hour transit is going on. 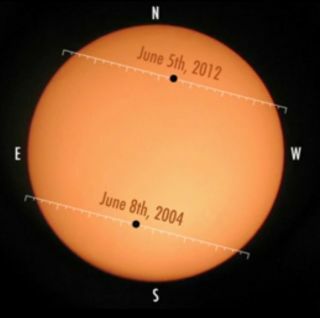 In North America, the best times to view the transit will be in the hours before sunset on Tuesday, June 5. NASA will be hosting a webcast of the entire transit that day, with live footage from the summit of Mauna Kea, Hawaii, accompanied by commentary from astronomers and transit experts. NASA's Solar Dynamics Observatory is expected to watch the transit of Venus from space. These observations will be used to calibrate the satellite's instruments, but will also help researchers learn more about Venus' hellishly hot atmosphere, agency officials said. Since the event occurs across the International Date Line, the Venus transit will occur on Wednesday (June 6) in Asia, Australia, Africa, and Europe.